Travel away from the city for a short holiday at a nature-rich campsite. You'll stay in dome tents for an authentic camping experience and take part in a laundry list of adventure activities and games. Fly over the campsite on a zip-line or go kayaking at a large lake located just adjacent to your tents. At the campsite's rope course arena, you can try your hand at rock climbing, rappelling and an obstacle course. You'll also go on a short trek to the Devaragudda hills and explore nearby caves. In the evening, kick back after a day spent outdoors and relax around a merry bonfire with some light music. 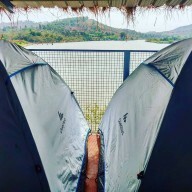 This campsite is located near the small town of Kanakapura and is accessible via a short 3-hr drive from Bangalore city. The campsite is surrounded by an expanse of green fields and farms, with a large lake located just adjacent to the camping grounds. You'll be staying in dome tents pitched at the campsite. • Spend a day at a nature-rich campsite at Kanakapura. • Try rappelling, kayaking, wall climbing and more. • Go swimming in the large lake besides the campsite. • Go on a morning trek to Devaragudda. • Spend the night in dome tents at the campsite. A basic level of health and fitness is required to book this trip. Travellers with any pre-existing medical conditions are advised to consult with their personal physician before booking this Kanakapura adventure camp. For cancellations made more than 14 days prior to your check-in date at the Kanakapura adventure camp: 80% refund. For cancellations made 7-14 days prior to your check-in date at the Kanakapura adventure camp: 60% refund. For cancellations made 1-6 days prior to your check-in date at the Kanakapura adventure camp: 30% refund. For cancellations made less than 24 hrs prior to your check-in date at the Kanakapura adventure camp: no refund. All refunds will be processed after deducting a transaction fee of INR 200 per person. This transaction fee is charged by The Great Next. Check-in time at the campsite is 9:00 hrs, while the check-out time at the campsite is 10:00 hrs. Early check-ins and late check-outs are subject to availability and may be charged. If you wish to use the conference hall at the campsite, you'll need to bring your own projector or rent one for an additional charge of INR 6,300 per group. The conference hall comes with speakers and mikes. A DJ night can be arranged at an additional charge of INR 15,800 per group. The campsite can also arrange a photographer to capture candid photos of your trip at an additional charge of INR 8,400 per group. You're required to wear a life jacket at all times while participating in water activities like kayaking or swimming. There is no pick-up for this Kanakapura adventure camp. There is no drop-off for this Kanakapura adventure camp. Day 1 of the Kanakapura adventure camp: Check-in and enjoy! Arrive at your campsite by 9:00 hrs. After breakfast, you can begin with the many team-building and adventure games at the campsite. At a large lake by the campsite, you can go kayaking, canoeing, swimming or take a coracle ride. The campsite's rope course includes activities like wall climbing, rappelling and obstacle course. In the evening, you can relax with some tea and gather around a merry bonfire to some light music. Tents will be pitched after a hot dinner. Overnight in dome tents at the Kanakapura campsite. Go kayaking on the large lake adjacent to the campsite. After an early morning wake-up call and tea, you'll head out for a short trek to Devaragudda. Explore the caves, get enriching nature views and return to the campsite after the morning trek. You'll have breakfast and then check-out. Your trip ends here. Personal expenses such as alcohol or beverages etc. Overnight in tents at the Kanakapura campsite. Check-in time at the campsite is 9:00 hrs. Today's meal plan includes breakfast, lunch, evening snacks and dinner. You'll also be served a welcome drink on arrival and evening tea. You'll be accommodated in dome tents at the campsite. Today's meal plan includes breakfast only. You'll also be served morning tea. Check-out time at the campsite is 10:00 hrs. The Kanakapura campsite can be reach by hiring private cabs from Bangalore or Mysore. It is located at a distance of 90-km/3-hr drive from Bangalore and 100-km/2-hr drive from Mysore.